Accountability, in the form of standardized test scores, is built into many government literacy policies, with severe consequences for schools and districts that fail to meet ever-increasing performance levels. 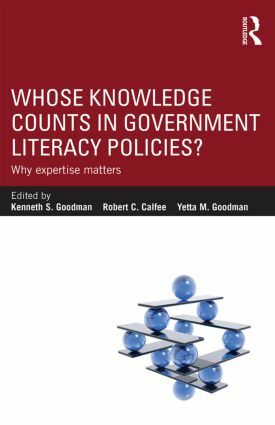 The key question this book addresses is whose knowledge is considered in framing government literacy policies? The intent is to raise awareness of the degree to which expertise is being ignored on a worldwide level and pseudo-science is becoming the basis for literacy policies and laws. The authors, all leading researchers from the U.S., U.K., Scotland, France, and Germany, have a wide range of views but share in common a deep concern about the lack of respect for knowledge among policy makers. Each author comes to the common subject of this volume from the vantage point of his or her major interests, ranging from an exposition of what should be the best knowledge utilized in an aspect of literacy education policy, to how political decisions are impacting literacy policy, to laying out the history of events in their own country. Collectively they offer a critical analysis of the condition of literacy education past and present and suggest alternative courses of action for the future. Diversity in Children’s Literature: What Does It Matter in Today’s Educational Climate? What Do Children Need to Succeed in Early Literacy— And Beyond?